Glossy Black with Red Felt in Texas 2018. 'SIMPLISTIC' is a billiard / dining table of an exquisite modern design. It is also our newest. It's stunning, cutting edge, ultra thin frame is lab tested for durability. 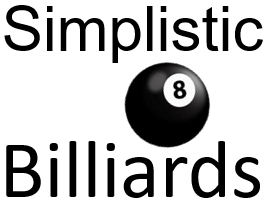 'SIMPLY' truly redefines billiards tables. We are enormously excited about its long awaited arrival into our public collection. Pictured below are our three standard options: Silver, Wood, White, Black. Simply in White will come with a white rail top, not the natural wood look in the photo. These are immediately available stateside for prompt delivery. "It Looks Great!" Adam in Missouri, 2018. SIMPLY ~ in Black Give us a jingle if you want a 100% black table... sorry no photos of clients' all black tables as of yet. ​ Skinny legs also available on black tables. You also have a selection of table top. We offer wood and glass table tops. Give us a call if you have any questions at all. New Felt Colors for 2018. ​We would like to introduce you to our modern design dining pool table “SIMPLISTIC” –thinnest frame pool table in the world! Available in size 7’ ONLY. Thickness of the whole top (frame + cushion) is only 7cm. It was achieved by using special construction design made by CNC metal frame and 1cm thickness oak veneered HPL cushion.